The most populous Spanish-speaking country in the world, Mexico, is a convenient destination for travelers departing from the U.S. This sizable country, roughly three times as large as the state of Texas, has desirable cruise ports on both its east and west coasts. Every year more than 10 million tourists visit Mexico on cruise ships alone. They come for the beaches and sun, as well as the culture and experience of the U.S.’s neighbor to the south. 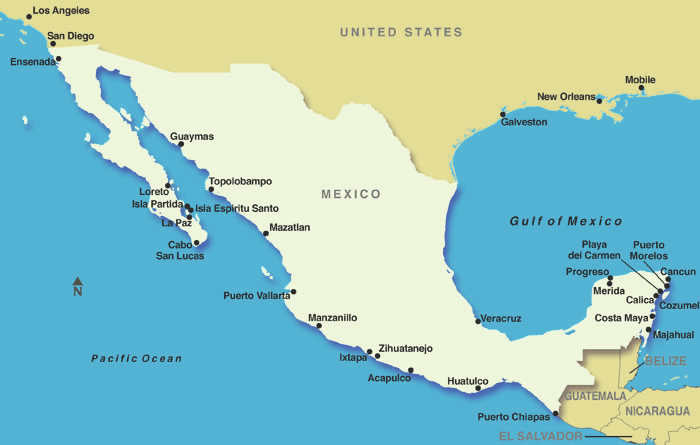 Cruises to the ports along the west coast of Mexico, known as the Mexican Riviera, typically leave from cities in California. Many itineraries depart from Long Beach, San Diego or Los Angeles. Trips along the Pacific coast will reveal a mountainous terrain and a drier climate in cities like Cabo San Lucas, Ensenada, Mazatlan and Puerto Vallarta. Ships sail for as few as three days or continue on for 12 nights. Just across the border from the U.S. on the Baja Peninsula lies Ensenada, a popular port for quick three- and four-day trips. Guests can spend time horseback riding on the beach, visiting Bufadora (a sea-water geyser) or wine-tasting at local vineyards. Further south on Baja, at the tip, is the port of Cabo San Lucas, a luxurious resort town with lots of amenities. Here guests will find superb shopping, gardens of black coral underwater or stretches of sand like Playa Del Amor. The eastern side of Mexico also has many popular destinations, most off of the Yucatan Peninsula. Many cruises depart from ports in Florida or other cities along the U.S. Gulf coast, before continuing on to Mexico’s Caribbean resort towns. Itineraries that last less than a week might include stops only in Mexico, while longer trips may incorporate additional ports in the Caribbean or Latin America. Cozumel and Calica (a common port for Cancun) welcome cruise guests to white sand beaches and are also a gateway to the pyramids and other ruins left by the Mayans.